Providing and maintaining robust channel data management solutions require more than just resources, but dedication. In order to establish an infrastructure built around success, channel data management solutions must be clearly defined, structured with such loyalty, transparency, and clarity that the relationship you share with your channel becomes an invaluable piece to their (and your) success. Well, if there is one thing you shouldn’t do, it’s building your own partner portal. Business operations require around-the-clock dedication to maximizing revenue, and when you (or someone in-house) has to constantly update, build and adjust portal-infrastructure, priorities lose focus, and you do a disservice to your channel partner. Unfortunately, many companies today rely too heavily on sales, marketing, and IT departments to manage the portal process. Allocating a surplus of unnecessary resources to be wasted, when a SaaS (Software as a Service) system can effortlessly avoid these problems. Did you know the average time it takes for companies to build their own portal is approximately one year? In business-years, that’s an eternity. Software as a service provider allows you to maximize business-efficiency because they have the tools (on-hand) to give your customers the best user-experience possible. If you’re finding it difficult to integrate a portal system that helps excel business operations, it may be time to re-evaluate what your customers see. The problem(s) might be more trivial than you think, and portal providers are trained specifically to identify these problems, no matter how ambiguous or obvious they appear. Right now, PRM solutions are changing. Customer interest and demand force tech experts to constantly modify solutions on a dime’s notice. When you’re managing your own partner portal, you don’t have the resources to keep up with the ever-evolving culture of technology. But when you align yourself with a third-party expert in PRM solutions, you alleviate the pressure that comes with constantly monitoring “what’s happening,” allowing you to focus on what’s important: your company. As your business grows, so do your partners. And the more partners you have, the more you will need to customize portal programs, which not only costs you time but money as well. Designing exclusive solutions to specific clients is imperative to your channel relationship. But when you establish a portal infrastructure that is singular to all your customers, you can expect your partners to notice—and probably lose interest. Building a savvy PRM system means more than just making it look pretty. Sure, structuring an aesthetically pleasing, user-friendly experience for channel partners is a top priority, but there is something even more valuable, and that’s an opportunity. When you deploy a SaaS portal for your business, you have a much higher opportunity for customer engagement via exclusivity, cohesion, information, organization, availability, accuracy and communication. A SaaS provider doesn’t just make your partners’ job easier, it makes yours as well. And happy people make for better opportunities. Founded in 1984, Computer Market Research™ (CMR) has delivered cost-effective, web-based applications and services to manufacturers to provide channel data management solutions for managing their channel data. Our client/server and web-based solutions accelerate and automate distributor and reseller data collection, processing, analysis, and reporting. Our state of the art software will help you increase partner performance. Channel software solutions, such as our portals, are pre-engineered and pre-built precisely to maximize efficiency with your channel partners. Computer Market Research provides a wide array of channel data management solutions which improve and solidify partner loyalty. 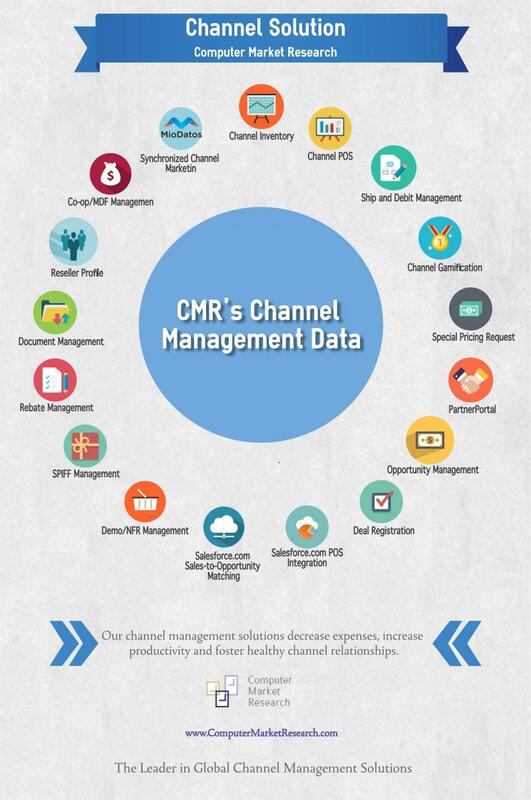 Our channel management solutions decrease expenses, increase productivity, and foster a healthy channel partnership.